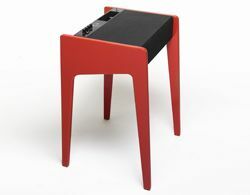 La Boite speaker systems double as desks | What Hi-Fi? If your laptop is the hub of your music system, then here's a different way of playing your tunes from French company La Boite. The LD Series are "the first hi-fidelity docking stations dedicated to laptops", combining a desk and a speaker system with audio inputs. The LD120 and LD130 have analogue RCA and USB inputs, a USB sound and integrated DAC and a seven speaker configuration. Four speakers at the front of the unit combine with an integrated subwoofer, while a pair of angled stereo speakers at the rear of the unit promise to use reflective soundwaves to deliver a wider stereo sound. The more powerful LD130 uses three separate amplifiers in a 2 x 25w and 1 x 80w configuration, while the LD120 has a maximum power output of 120w. Incorporating a selection of high quality materials – such as natural leather – the LD Series is available in real cherry wood, matt black and four luxury piano lacquers. La Boite concept is a French research and development unit with a team comprising audio engineers, industrial designers and production specialists. The LD120 with lacquered feet costs £870, the LD130 is £1,180 and the LD130 in wood is £1,290.